More power! 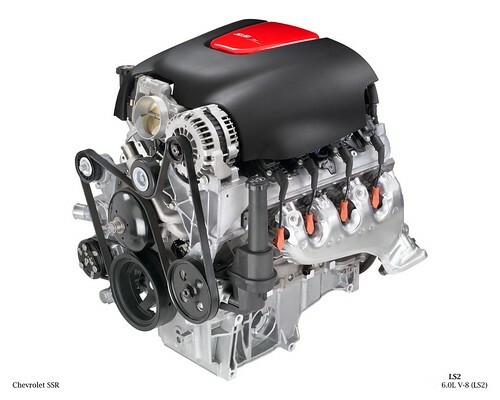 The 5.3-liter V8 used in SSR since 2003 was replaced in favor of a 6.0-liter LS2 aluminum engine with 390 bhp. 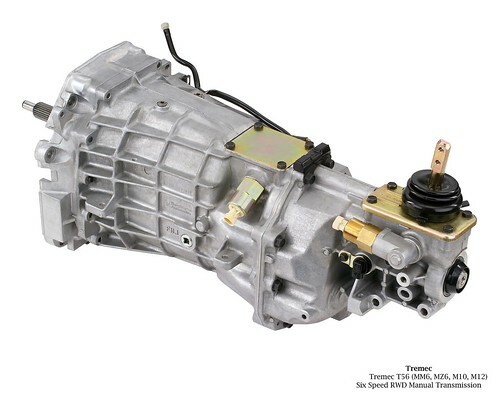 Newly optional this year was a six-speed manual Tremec transmission (November, 2004 availability) with an Eaton limited-slip differential. 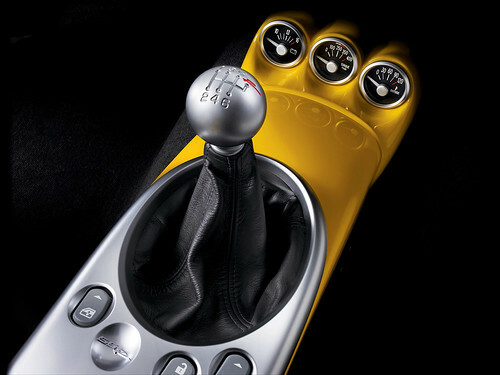 The higher horsepower and torque of the LS2 also dictated a more robust 4L65-E 4 speed automatic transmission as standard equipment (replaced the 4L60-E used in prior year SSRs). Total prodution for 2005 model year was 7,279 units. Click here for production detail. 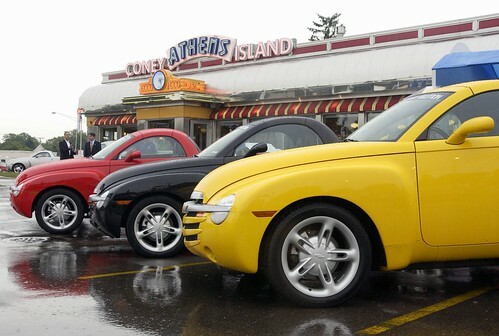 Ever since its debut for 2003, the Chevrolet SSR with its retractable hardtop has been turning heads as the ultimate boulevard cruiser pickup truck. For 2005, SSR gets to snap some necks with a potent new 6.0L LS2 V-8 engine and available six-speed manual transmission straight out of the legendary Corvette. Flexing potent new muscle to match its stunning looks, SSR is powered by the newest version of Chevy’s legendary small-block V-8. Ratings are 390 horsepower (291 kw) at 5400 rpm, while torque is 405 lb.-ft (549 Nm) at 4400 rpm. This massive power dose is harnessed through Corvette’s Hydra-Matic 4L65-E four-speed automatic transmission or an optional Tremec M10 six-speed manual gearbox. Engineering advances in catalyst materials made possible catalytic converters that are more effective and less restrictive for the LS2’s exhaust. The new converters are mounted closer to the exhaust manifold for quicker “lightoff” and reduced cold-start emissions. SSR’s exhaust has been retuned to maintain its throaty sound. Aqua Blur replaces Ultra Violet in SSR’s exterior body palette. Also new for 2005 are several new GM accessory packages that include: auxiliary gauge package (volts, delivered torque, exterior temperature); a body color package, which adds the exterior color to SSR’s auxiliary gauge package, engine cover insert and cargo area strips; a body color package with running boards; and a windbreak. While SSR’s dramatic exterior shape may recall the full-fendered forms of the late ’40s and early ’50s, this innovative roadster is anything but retro when it comes to incorporating leading-edge technology and creative design solutions. One of SSR’s most distinguishing features is its cleverly engineered power-retractable hardtop, which provides an open-air driving experience without sacrificing cargo space. 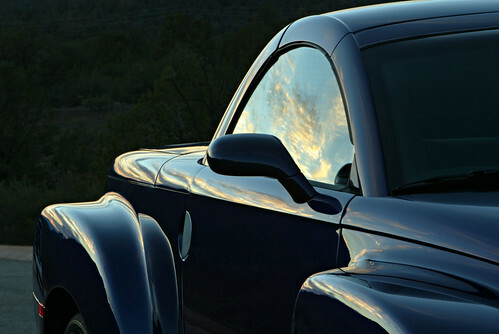 Incorporating a “top stack” design, SSR’s retractable hardtop is the first ever applied on a pickup. It is the only system of its kind where the roof panels move independently, stacking vertically behind the passenger compartment – a design that ensures quick operation with minimal stowage requirements. A single button on the console transforms SSR from an enclosed hardtop to a convertible in less than 30 seconds, neatly tucking the roof panels rearward between the passenger compartment and cargo bed. This unique vertical storage design system enables SSR to maintain the utility and convenience of a pickup – even with the top down. SSR’s interior design is based on Chevrolet's twin cockpit approach, with a horizontal cross-car bar and body-colored accents that pull exterior design cues inside. The satin chrome aluminum look used on elements of SSR’s exterior continues on the interior door trim and instrument panel bezels. The cleanly styled instrument panel contains gauges with bold graphics and a simple three-dial design for all climate controls. SSR’s flared front fenders and quarter panels are formed using a blend of modern technology and some traditional methods used to produce the original 1947-1953 Advanced Design Chevy lineup of pickup trucks, which formed the inspiration for this unique modern-day muscle truck. The stamping process, for example, uses a unique method called “inverted toggle draw,” which combines the original toggle draw process and the more recent stretch draw concept. The use of new Grade 5 deep-draw quality steel enables these shapes to be formed without splitting. Underneath its sleek exterior, SSR incorporates a body-on-frame construction, which is an upper steel unibody mounted on a boxed frame. Fully hydroformed steel side rails provide the frame with strength and stiffness, relatively low weight and precision fits. Eight cross members – as opposed to only four or six in similar frame designs – boost structural strength while contributing to a smooth ride, more precise handling and reduced noise and vibration levels. The upper unibody helps support SSR’s retractable roof system, while minimizing the loss of structural integrity typically associated with convertibles by augmenting the stiffness of the entire vehicle with special cross members. For 2005, SSR’s steering system is significantly revised, including a retuned valve and t-bar assembly, and a new bearing and friction seal package. These upgrades provide a more precise on-center feel, smoother overall operation and reduced effort at lower speeds. SSR’s stiff frame and specifically tuned suspension provide a boulevard-cruiser ride, yet is responsive enough to handle the added horsepower of the LS2 V-8 while also delivering the durability levels expected in a truck. The front suspension uses upper and lower control arms for superior kinematics, damping and stability, and works with SSR’s rack-and-pinion steering to provide precise control. SSR’s rear five-link live axle suspension, which uses monotube shock absorbers with mountings outboard of the frame, also provides improved body and wheel control. Steel coil springs and a micro cellular urethane auxiliary spring enhance ride comfort and stability during fully loaded conditions. The SSR equipped with an automatic transmission has standard electronic traction control, an 8.6-inch (21.8-cm) rear axle, a Torsen differential and massive P295/40R20 rear tires ensure that SSR delivers its power to the ground with exceptional traction and control. The Torsen differential, proven on performance cars, works seamlessly with the traction assist to maximize performance during strong acceleration or over varying road surfaces. The SSR with a manual transmission foregoes the traction control feature and utilizes a 9.5-inch (24.1-cm) rear axle with an Eaton limited slip differential. Four-wheel vented disc brakes with ABS and dynamic rear proportioning provide SSR with outstanding stopping performance, and world-class levels of brake feel, wear resistance and low noise. The use of non-asbestos organic compound lining extends brake life to 40,000 miles, depending on vehicle use and payload. ABLUR05, Layne12gun, Railroad Guy and 2 others like this.